All-Terrain-Vehicles or ATVs are special vehicles that are quite capable off-roading vehicles. These highly capable vehicles are used by enthusiasts for serious off-roading and rallies too. Even cops use such ATVs to reach difficult places. However, ATVs are not road-legal and cannot be registered for legal road usage. However, Powerland, a new brand in the Indian market has registered its ATV as an agricultural tractor vehicle, which makes it a road-legal vehicle. However, their insurance will be different from regular vehicles. Here is a video of Powerland 900D, which can be seen registered and was ridden on the public roads of Mumbai. The video put up by Horsepower Cartel shows the new ATV in all its glory. The Powerland imports the ATVs from Linhai in China. The ATVs are assembled right here in India, which makes them priced competitively against the other ATVs in the market. Even though it gets registered as a tractor vehicle, it gets a white number plate indicating that it is registered as a private vehicle. Also, a helmet is not required to ride this ATV. The Powerland 900D is powered by an 800cc diesel engine that is not turbocharged. It generates about 20 Bhp of peak power and 48 Nm of peak torque. The engine is mated to a CVT automatic gearbox and gets 4X4 system too. There is a low-ratio transfer case, which can be used in challenging situations to get the vehicle out without any problem. The ATV gets 12-inch rims and all the wheels get disc brakes. The high-travel suspension makes the ATV very off-road friendly and capable. At the front, it gets DRLs and two projector headlamps and LED tail lamps. The video shows that the bike gets a push-type accelerator, similar to the regular ATVs. It gets a seating capacity for two and because it is registered as an agricultural vehicle, there is a permanent towing hook placed at the rear of the vehicle. There are also two storage racks at the rear and the front of the vehicle. The video first shows the ATV being taken to a beach where he moves around the beach without any problem. Most vehicles face problem on the beach because of the soft sand that can make the vehicle’s tyre stuck. He even takes it to the road through a staircase, showing the ATV’s capability. He later also takes the vehicle to the roads of Mumbai, where he can be seen cruising comfortably around the roads. The video does not mention the price of the vehicle but it is priced around Rs. 4 lakhs and the on-road price of the vehicle will be arou nd Rs. 4.4 lakhs. 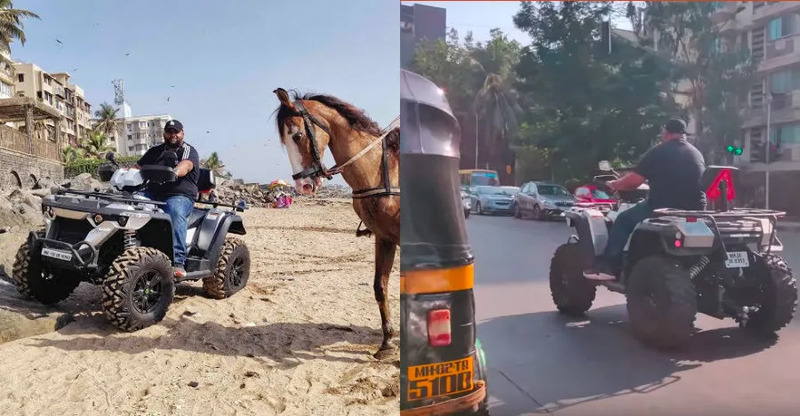 Powerland also donated an ATV to the Mumbai Police recently for patrolling on the beach. Even the state police of Uttar Pradesh were seen using the same Powerland 900D ATVs during the Kumbh Mela for patrolling. « MG Hector SUV caught undisguised, months before launch!